To travel around Indonesia you need a lot of patience. The rides are long and public transportation is limited. In many places there is no public transport at all, and the only option is to negotiate a taxi or rent a motorcycle. To buy train tickets (Java) and plane tickets online, sometimes you need to have a local credit card. Fortunately there are several shops, offices and travel agencies where they can buy it for you and pay them in cash with a low commission. We flew in the morning from Singapore to Bali (Denpasar). Since there are no buses, we took a taxi from the airport to Seminyak, a very famous beach close to the airport. 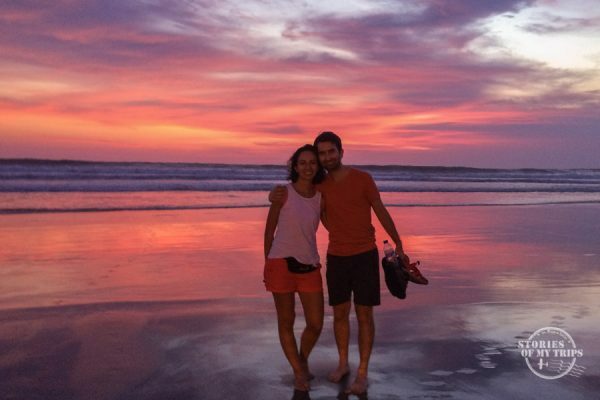 We stayed two nights in Seminyak, where we enjoyed beautiful sunsets. 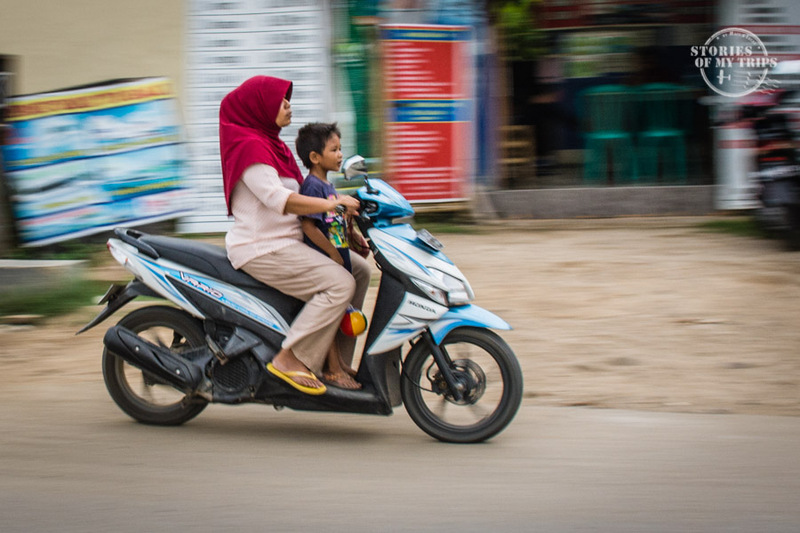 Since we didn’t know how to ride a motorbike, we walked between the nearest beaches, such as the famous Kuta, which is a few miles south where the nightlife is perhaps the most important in Bali. But we realized that having the ability to ride a motorbike was very important in this part of the world, so this day we found a guy who taught Lucas to ride a bike. Of course one day of practice is not enough, but it was a good first step. 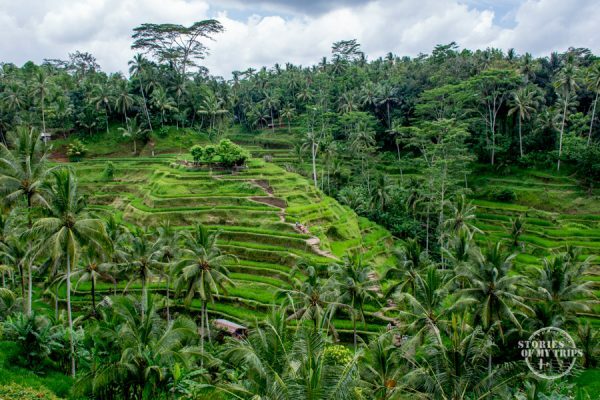 We then headed to Ubud, right in the center of Bali where the scenery is completely different. To go from Seminyak to Ubud the only option we had was to negotiate a taxi that dropped us off at the hotel where we stayed for 3 nights. Here we enjoyed the tranquility, culture and nature of the place. You can do some walking activities, but the best way to go around is to rent a scooter or a driver for the day to visit the different temples and rice terraces, which are several kilometers from the village. Since we were new riding motorbikes, we only hired a scooter to go to the rices terraces and to the villages nearby. To go further away we hired a driver for the whole day who took us to see many different temples and sights around the island. We went next to the northeast of Bali, to Tulamben, famous for its snorkeling and diving. To go from Ubud to Tulamben we found a travel agency selling tickets in a minivan to Ahmed, passing through Tulamben. 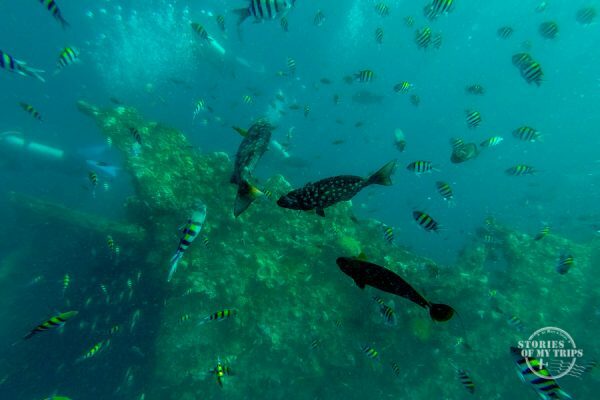 In Tulamben you can find an American shipwreck from World War II, only a few meters deep, so you can see it just by snorkeling. We enjoyed the aquatic life for two days, which was really impressive. There was no need to leave the hotel as it was right on the beach, and from there we were able to swim to different points with the snorkel. Our next destination was the Gili Islands, specifically Gili Air. To go from Tulamben to Gili Air, we took a minivan to Amed, arranged by the hotel, and there we took a ferry to the Gilis. The beaches are crystal clear and the snorkeling and diving are great. 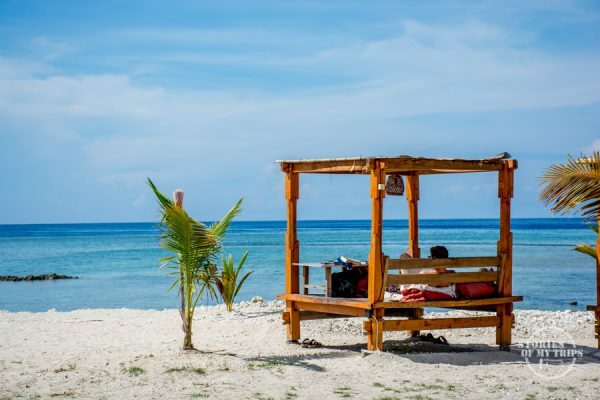 We could see Sea turtles just a few meters from the beach, and throughout the island they offer a snorkeling tour to the 3 Gilis which is very unexpensive and very good value. We enjoyed the peace and beauty of Gili Air for 5 nights where we dived, snorkelled and relaxed to the rhythm of the island. 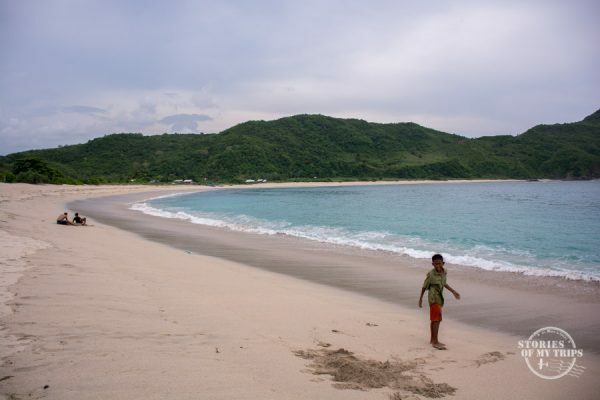 Our next destination was Lombok , supposed to be the new Bali. A small boat took us to the port of Bangsal and then a minivan took us to Senggigi. It is a small town and you can walk to the beaches. The next day we took a minivan to Kuta, and there we rented a motorbike to visit different beaches and the inland part of the island. Next we wanted to see the Komodo dragons. To get to Komodo Island you have to go to Labuan Bajo on the island of Flores. To go from Lombok to Labuan we took a flight with a stopover in Denpasar. At the Labuan Bajo airport we shared a taxi with other travelers, and quickly arrived at our hotel. The main street is full of travel agencies and diving schools, here you can find the plan that you want to visit Komodo. A “cruise” for one day, two days one night, three days two nights etc. There are also Liveaboards to go diving for several days or trips to go diving for a day. There are many options! 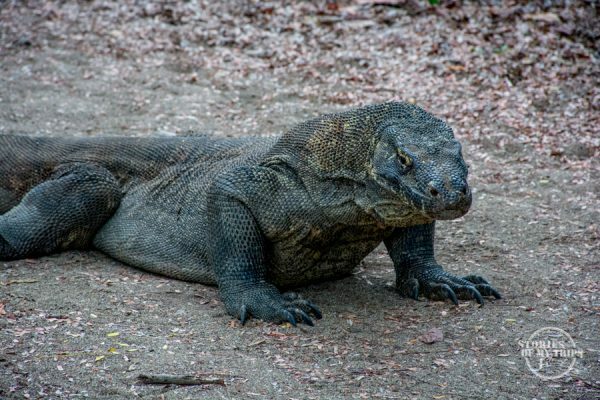 We went diving for a day, then took a two days one night “cruise”, which took us to Rinca and Komodo the first day to see the dragons, and the second day to several islands to snorkel with mantas, visit coral gardens and some remote beaches. Our next goal was to get to Java. To go from Labuan Bajo to Java we first had to take a plane to Bali. We landed in Denpasar and took a taxi to Ubung bus station (not Ubud!). There we took the bus that goes to Gilimanuk (the most western tip of Bali). This was a rather old and uncomfortable bus, where we traveled for 5 hours. At the port we took the very slow ferry that crosses to the island of Java. 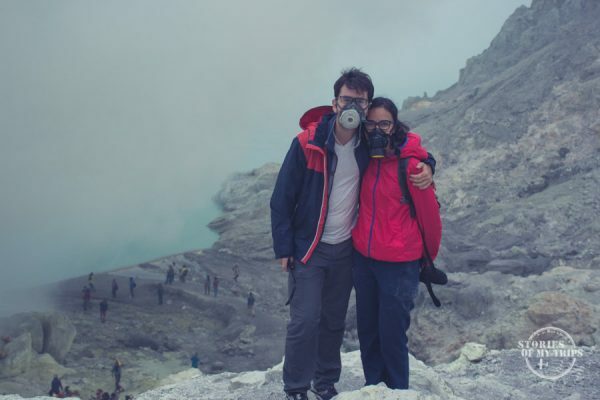 We wanted to go to Mount Ijen, so when we arrived in Java we asked around how to get to Karangasem (train station near the volcano) and a security guard took us instead to his friend, a taxi driver (this is very common in Indonesia). It was already dark, so we negotiated with the taxi driver to take us to the city and find us a hotel. In Indonesia it is like this always. All the people who make a living off tourism, are connected among them, the guard takes you to his friend the taxi driver, the taxi driver takes you to his friend’s hotel, the hotel sell you the friend’s tour etc, and in each transaction everybody is earning their commission. Sometimes this is very irritating, but many times it is the only option. As expected, the taxi driver offered us the tour to go to the volcano, as it was 10pm and we wanted to leave at midnight, we didn’t have time to look for another option, so we agreed to go with him. To go to the volcano you don’t really need a guide, but we needed the transportation and the gas masks, and well, the guide was already included by default in the package. The climb to the volcano was difficult and somewhat disappointing. We started off at midnight, saw the sunrise in the crater, and returned to the minivan almost at 7. By 8 we were back at the hotel, just in time to take the 9 o’clock train to Probolinggo where Mount Bromo is. The train to Probolinggo took 4 hours and when we arrived we took a minivan that took us to the “bus station”, which in reality was a travel agency, from where the bus to Cemoro Lawang leaves. 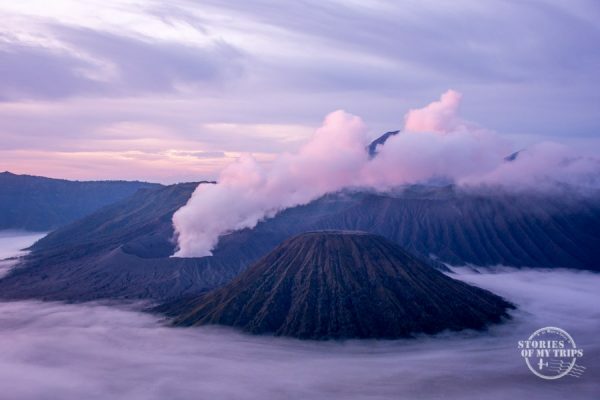 This is base of Mount Bromo. You have to wait for the bus to be full, or you can negotiate to pay the full price. And sometimes you have to wait up to 4 hours for it to be full! We were 4 and we decided to pay the full price to leave as soon as possible. The journey lasted an hour and the driver dropped us off at the hotel. From there it is very easy to do the early hike to Bromo to see the sunrise. And no guides are needed. That morning we returned in time to take a minivan that took us back to the Probolinggo train station, to take the train bound for Yogyakarta. The journey was around 9 long hours. Yogya is quite large and has public transportation! (something unusual in Indonesia), and taxis are ok because they use the meter and do not overcharge you for being foreign (of course you have to ask them to turn it on). It was possible to go to the Prambanan temple using public buses (bus 1A). 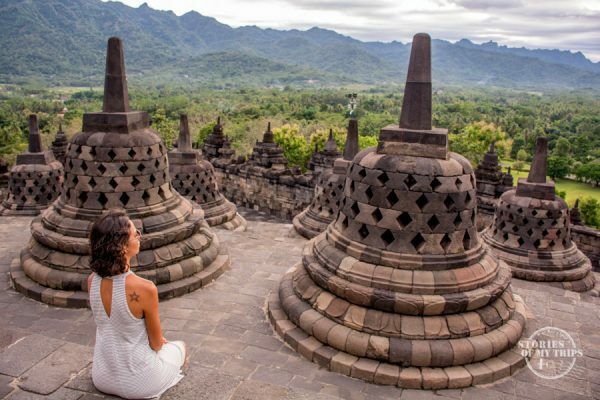 It is also possible to go to Borobudur by public transportation (but not at sunrise): take a local bus to the bus terminal Jombor, then a long distance bus to the temple that takes around 1.5 hours. At Yogya we stayed 4 days and it rained the whole time, so we couldn’t do everything we would have liked. It is a bad idea to go to Java in the rainy season (the rest of Indonesia was ok). After Yogya we had to get to Jakarta to take our flight out of Indonesia. We bought the train ticket in a shop where they buy it online using local credit card, and print the reservation for you. When we arrived at the station we claimed the tickets to board the train. This train took about 8 hours and when we arrived we went straight to look for BlueBird taxis, which are the most reliable because they use the meter. We only spent one night in Jakarta and the next day we took a taxi to the airport after we negotiated a good price. There are also shuttle buses but the price for two was almost the same price as the taxi. This is how we ended our first tour of the immense and beautiful Indonesia. We were planning on doing so much more, so we will have to return with more time and with all the experience we gained from how things work in this country. In future publications we will tell you more about what we learned and did in every place we visited. Posted in Indonesia, Routes, Transportation and tagged Bali, how to, Indonesia, Komodo, routes, transportation, travel. Thanks so much for sharing tales of your visit and travel around Indonesia. It was a super helpful and interesting read. My partner and I will be heading there in a few weeks and have a similar itinerary. I was just wondering if you remember the name of the travel agency that you found in Labuanbajo and/or if you prearranged the “cruise” that you took or if you just found it upon arrival. Also if you happen to recall the approximate cost I would love to know. Thanks again for taking the time to document your trip and share it with other travelers! Hi Sian, thanks for your message! We didn’t book in advance the cruise, once we got to Labuan Bajo we walked down the main street which is packed with agencies offering the tours. We chose the first one we found that was leaving the next day and had availability. I don’t remember the name, but there are some many offers that I’m sure you’ll find one that suits you. Enjoy your trip!